R Fulton Improvements has been in the HVAC business more than 20 yrs. Our experienced and knowledgeable contractors are ready for your ducts. Do you need ducts installed, repaired, cleaned? Call (678) 251-9181 now! All HVAC systems begin with the proper design and installation of the ducts. Ductwork installation, repairs, replacement and/or design requires skilled, experienced technicians. Having been in business over 20 years, you will receive this and more. Our technicians provide top quality service and trustworthy advice, leaving you with a highly efficient heating, cooling and ventilating system. Having an efficient HVAC system will not only leave you and your family feeling comfortable in your property, but more importantly, save you money. 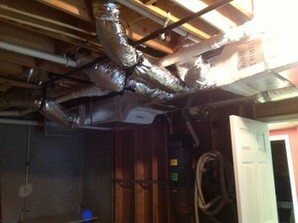 For ductwork installation or repair, call R Fulton Improvements at (678) 251-9181 for a quote. R Fulton Improvements has been installing, repairing, and servicing ductwork, with close attention to every detail, for over 20 years. We inspect the duct's air flow using advanced diagnostic tools. In spite of providing A+ quality services and skilled technicians, R Fulton Improvements strives to offer competitive prices in the area.